The Faith Trio is an alliance of Muslims, Christians and Jews of three congregations in the Oakland area: the Islamic Cultural Center of Northern California, Montclair Presbyterian Church, and Kehilla Community Synagogue. The Faith Trio formed as a result of the attacks of September 11, 2001. One Sunday, weeks after the attacks, three Muslim women (a mother and her two grown daughters) visited Montclair Presbyterian Church. After the service one Christian woman asked if she and others could visit an event at the Islamic Cultural Center. That year, Muslim-Christian friendships developed as members of both congregations joined in each others’ events, leading to annual Harvest Dinners. In 2005, Kehilla joined the alliance, bringing together the three “Abrahamic Faiths” and calling themselves the Faith Trio. The Faith Trio has organized interfaith art exhibitions, poetry readings, text study sessions and participants have volunteered together at a food bank. These activities are organized through monthly meetings of representatives from each congregation, the Faith Trio committee. 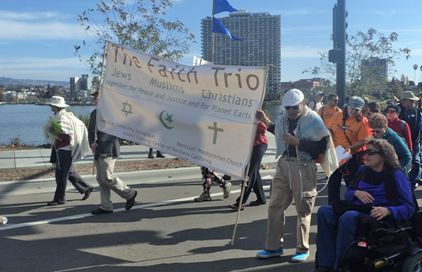 On November 21, an interfaith Shabbat morning service was sponsored by the Faith Trio. The worship service was organized and led by Rabbi David J. Cooper and was attended by about 80 people from the three congregations and others. Following the service, participants joined thousands of others in a march to Frank Ogawa Plaza in front of Oakland City Hall, and a rally to demand meaningful action at the international conference in Paris to reduce carbon emissions and curb climate change. The march and rally were organized by the NorCal Climate Mobilization. The interfaith Shabbat service incorporated prayers and readings from the holy writings of the three “Abrahamic religions” (Islam, Christianity and Judaism) while following the traditional structure of a Jewish Shabbat morning service. Musical Prayer Leaders Julie Nesnansky, Beth Dickinson, and Debbie Fier accompanied the readings and prayers. Readers were Rashid Patch, Ali Sheikholeslami and Mehrnoosh Paya of the Islamic Cultural Center of Northern California, Peggy Alter and David Siegenthaler of Montclair Presbyterian Church, and Lea Delson of Kehilla Community Synagogue. Local participants in the interfaith service were joined by a group of 20 Jewish teenagers visiting from two synagogues in Oregon (Corvallis and Ashland), and also by local teenagers involved in JYCA (Jewish Youth for Community Action), who contributed a lot of spirit and enthusiasm.